When we talk about how dangerous PROTECT IP is as a censorship bill, we're often told that we shouldn't worry so much, because it's only targeted at "rogue sites" and thus wouldn't impact any legitimate sites. We're told there's nothing about rogue sites that is worth defending. And yet, as we've seen with the list of "pirate" sites that GroupM put together with help from the music and movie industries, their definition of a "pirate" site is expansive in the extreme. It included the Internet Archive, Vimeo, Soundcloud and a ton of blogs and news sites, including the famed Vibe magazine. And don't think it gets any different when you hop over to the trademark/counterfeit side of the debate. In Tim's post about Monster Cable lobbying in favor of PROTECT IP, as an aside at the end, he notes that on Monster Cable's own list of "rogue sites," eBay and Craigslist top the list. And it doesn't stop there. Retailing giant Costco is on the list. As is Sears. Also some Backpages sites are listed as well (Backpages is a Craigslist-like classifieds system). There's also FatWallet, which is one of the most popular "deal" listings sites out there. There's also PriceGrabber and ComputerShopper -- popular legitimate sites for comparison shopping and computer purchases. These are not "rogue sites." These are legitimate companies that Monster Cable appears to have a vendetta against, because they allow for or promote the resale of perfectly legitimate secondhand goods. In other words, for all the misleading whining from Monster about how it needs PROTECT IP to stop "rogue sites," you can see from Monster's own definition of what it considers a rogue site, that it would like to use such things to stomp out legitimate secondhand sales. Now, you can argue over whether or not these sites would pass following a judge's scrutiny under PROTECT IP, but we've seen judges rubber stamp similarly questionable claims against blogs in the past as being "rogue sites." If you look at both the GroupM and the Monster lists, one thing becomes clear: these companies are defining any site they can't control as being a "rogue site." This isn't about stopping "piracy." It's about using the law to stomp out channels that they can't control. This is a key point that becomes obvious if you spend any time looking at the details of this law. It's not about protecting "IP." It's about protecting old business models that were based on absolute control of the channel. The complaints of the Universal Musics and Monster Cables of the world isn't really about counterfeits and piracy, but about the fact that they no longer have absolute control. And they're just using "piracy" as the wool to pull over Congress' eyes to pass a law that tries to give them back control over the channel... by declaring tons of perfectly legitimate sites "rogue sites." The online movie streaming business is an interesting one, which Netflix currently dominates, though it's definitely still early. While Netflix's solution is far from perfect, there's just something about the way in which Netflix set up its online offering -- where people pay for access, rather than content that has been quite appealing to many people. However, with so much interest in online movie streaming, it's not surprising to see others entering the market, though it appears that many are taking a cargo cult approach to creating online movie streaming services: they just put together a service that offers movies for streaming, without taking the time to understand why they work or what people actually want from them. A few months back, we wrote about Best Buy's online movie service, called CinemaNow, which is just the branding slapped on a service from a company called Sonic Solutions (somewhat confusingly, Sonic had owned and used the CinemaNow brand, but then sold it to Best Buy, who used it to offer a service powered by Sonic). Rather than following the Netflix online model of paying for access, the Best Buy/Sonic solution followed the old Blockbuster model: pay $15 to "buy" (really license for the life of your account, or until the service shuts down) or $4 to "rent," which would allow you to watch the movie within 30 days -- but once you started it, you would need to finish it within 24 hours. Those "24 hour" windows have been tried before, and they serve no purpose other than to absolutely annoy and piss people off. In talking to people who follow these services, we've heard that CinemaNow has had dreadful pick-up rates. People just really aren't that interested, and it's not hard to see that services like Netflix appear to be a hell of a lot more user-friendly. Best Buy recently tried to amp up its marketing of the service, and the best argument it can make against Netflix is: "We tell people to think of it like using Netflix, except you get to keep what you actually buy." Except, of course, that's not really accurate, nor compelling. First of all, you don't really get to "keep" what you "buy." In fact, you don't really get to "buy" anything. You just license it, and you lose it the second your account closes (or, again, the service goes out of business). And, of course, with the way the Netflix system works, you have unlimited access to every movie in its system anyway, so you basically get to "keep" all of the movies, anyway (if you define "keep" the same way Best Buy is defining it). Anyway, the latest on this front is that Sears & Kmart have jumped into the fray with their own service, which appears to be little more than an identical clone to BestBuy's CinemaNow. The Sears/Kmart solution is called Alphaline Entertainment (huh?) and is also powered by Sonic -- but here the prices are actually higher. The faux-own option now costs $20, rather than $15. So you have a solution that is not compelling, has serious limitations, significantly underperforms the competition and is more expensive than an identical solution from the same core provider. Are Sears & Kmart really saying that their target market is uninformed suckers? Adam sends in a link to a Reddit story where it comes out that someone (not entirely sure who) decided to push Reddit to take down an earlier story. 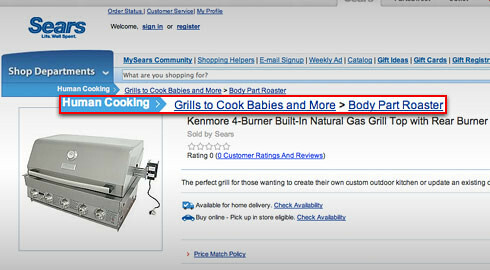 Apparently Sears.com had some oddity in how content on its e-commerce site was displayed, and with a little URL-hacking some folks were able to create a Sears.com e-commerce page for a barbecue grill designed to cook babies: Pretty amusing, and obviously something that Sears wasn't all that happy about. Sears's explanation for what happened doesn't quite make much sense, but what would you expect? It wasn't so much "defacing" from the sound of it, as it was a bug in the way the site was set up, but, what doesn't make much sense is that someone then forced Reddit to remove its original thread discussing Sears' URL hackability. It's not at all clear who specifically got Reddit to take down the thread, though an admin admits that he was told to take it down. The obvious list of culprits, of course, would be Sears and Conde Nast (owners of Reddit). Still, it should come as no surprise that the Reddit community doesn't take kindly to the idea that someone (whoever it might be) can dictate that a Reddit thread get deleted when it's not spam. So, now they've been pumping up this particular story about Reddit pulling down the thread, giving the whole story much more attention. Wouldn't it just have been better to fix the URL-hackability and let things be? I'm pretty sure that attorneys would understand the breadth of the consent covered by the phrase "online browsing." It means everything. The position taken by the FTC signals the agency's belief that consumers should not be treated like lawyers when it comes to privacy-related disclosures. The FTC also appeared to be concerned about the fact that the disclosure was buried in a lengthy privacy statement, which was displayed to the consumer rather late in the consent-collecting process. This is a good thing. Customers shouldn't need to be lawyers to understand what it is they're agreeing to, and it's nice to see the FTC recognize that fact. A reader named EmJay wrote in with a snide comment about how we wouldn't write about the following story because it's a case where "copyright and patents made sense." I never understand these sorts of comments. We write about all kinds of cases, and if there were one where an intellectual property lawsuit made sense, we'd be thrilled. It would be an example of the system working as planned: encouraging innovation. That would be fantastic. Unfortunately, EmJay's example is no such thing. It's not an example of the system making sense, but of the system being used to slow down innovation and block competition. The story involves a guy who started making plastic turkey wishbones for Thanksgiving/Christmas celebrations, so that families wouldn't have to fight over the actual turkey wishbone in the traditional "breaking" of the wishbone. Of course, maybe it was just my family, but I don't recall ever "fighting" over the wishbone. Anyway, the agency Young & Rubicam, which represents Sears, had asked for a sample for possible inclusion at Sears. A year later, Sears was selling a similar plastic wishbone, made by a different company, so this guy sued and won. From the article, the guy says they won on both patent and copyright infringement claims, but that's not true. The lawsuit was over copyright infringement claims only, and Sears made two good points that should have prevailed, in our opinion. First, you can't copyright something occurring in nature -- such as a wishbone. Second, the wishbones that Sears ordered were in different colors and sizes than the ones supplied by the original company. And, in fact, that's exactly how competition should work. Sears pushed another manufacturer to innovate, designing different (and, in their opinion, better) wishbones. That's competition and that's how innovation works. In fact, the guy from the original company now admits that his company didn't do any updating of their design for years while fighting this lawsuit, and are just now starting to update the design. In other words, all copyright did was get these companies locked in a silly legal battle, rather than focusing on providing better solutions to customers. It's too bad this guy was afraid to compete in the marketplace. Last month we wrote about how Sears and K-mart's websites both were urging people to join a "community," but that community didn't seem like much of a community at all. Instead, it involved quietly installing Comscore's tracking software without telling the user, and then tracking all of their web usage. Following all of this, a VP from Sears responded to CA's original post on the subject trying to refute the claims. However, well-known spyware researcher Ben Edelman has now weighed in on the subject, checking out this "community" and finding plenty to dislike. As the initial report noted, it's not clear at all to users that they're installing Comscore's tracking app, and even the few notifications that mention it are somewhat unclear. Given that both Edelman and CA have pretty clearly documented what's happening, it's hard to see how Sears can claim that the company "goes to great lengths to describe the tracking aspect." Rich Kulawiec writes in to let us know that Sears.com and Kmart.com (owned by Sears) have been inviting visitors to those sites to "join our community." However, rather than joining any actual community, what you appear to be doing is installing spyware that reports on your every move online. It's actually a trick to get you to install Comscore's tracking app. Comscore has been accused in the past of distributing spyware surreptitiously, which the company vehemently denies -- but it's hard to see how this is above board. It's certainly worse than Facebook's Beacon fiasco. What happens is that you are asked if you want to "join the community," and then, without clearly explaining what the software does, Comscore's tracking software is installed. After that, all of your online activities -- including to "secure" sites like banking sites -- is sent directly to Comscore, despite Sears' website insisting that none of the data you share will go to anyone but Sears. As for the "community," it doesn't seem like there is one. The security researcher who signed up for the community says that once the software is installed, there's no obvious indicator that it's installed or running -- and he received no "communications" from the so-called community whatsoever. Basically, it sounds like it's just a trick to get you to install this tracking software while hoping you'll forget about it.